My horse, Takoda, is a paint/halflinger. before my first walk trot show this year he would stop on a dime, and do everything i asked! but now that i moved up to novice, when ever i stop after we are done working, he wont move. i try to turn him, i used a crop and he dident seem to care! so in the end i HAVE to get off and pull him! i can have someone pull him or smack him but he just wont listen! I was told to turn him around, to keep him moving and i do but when im done he just stands there! i mean i dont ride him that often cause i have other things to! but he just wont listen to ME! when ever I have my sister get on him hes fine! but as soon as i get back on, NOTHING! Do you take riding lessons or work regularly with a qualified horse trainer? If not, it would be a good idea to pursue one or both of those avenues to get some “hands on” help with you and your horse. Whenever someone says a horse used to be good and now is not so good AND when my sister rides he is fine but as soon as I get back on, there are problems, well you can see where that leads us. Add to that the fact that you are getting mad, well, it clearly shows that you would benefit from a qualified instructor’s help. Perhaps you can find one through your local 4-H, Pony Club or Horseman’s Association. If you don’t know of an instructor, you could contact The American Riding Instructors Association, known as ARIA. When you get to the website, in the left hand column there is a link to help you find an instructor in your area. There is something you are doing with your mind and body language that is interfering with you becoming an effective rider. A good riding instructor will be able to identify what is occurring and help you over come that so your horse gets the message that it is not only OK but desirable for him to move forward. I’ve answered a similar question recently Horse Won’t Move Forward which should give you some good ideas. And visit my Horse Information Roundup where you can find all sorts of helpful articles on riding and training. Horse Training – What is Natural Horsemanship? I’ve used your book Making not Breaking for a number of years, before natural training was invented. 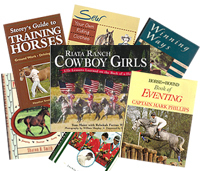 Now that I’ve attended some natural horsemanship clinics, it seems your book is more natural than some of what I’ve seen. Why isn’t your training called natural? Interesting question. Here’s some information to help explain the answer. I wrote Making Not Breaking in 1990 and it was published in 1992. A practical approach for English and Western trainers that works with not against a horse’s natural instincts. Presenting the Real World Training System for Young Horses. The buzzword “Natural” in relation to horse training and horsemanship started showing up about the mid 90’s but the principles and techniques, the good, the bad and the ugly, have all really been around for as long as man and horses have interacted. We live in a media marketing society and the phrase Natural Horsemanship is mostly a marketing tool, a handle, a hat to wear. By personal choice, I am not into labeling something as this or that because most things in life are not black or white, they are somewhere in between. And most people are evolving beings, they change, so may or may not be the trainer they were or will be. Being a writer, I know the power of words. I also know the rampant misuse of words. If something is called natural it must be natural, right? Wrong, we sure know that with food labeling. But what is natural anyway? In terms of horses, natural would refer to a horse that is born in the wild and is free to graze, roam, socialize, procreate and basically act like a horse. Yet all natural horsemanship trainers do the things above and many more “unnatural” things. Yet if we saw a trainer kicking or biting a horse, he or she would likely be labeled as something far from a natural trainer. So, realistically, my aim is not natural, but mindful, reasonable horse training and care. I suggest horse owners learn How to Think Like a Horse and then work with a horse’s natural behaviors to help the horse become a willing partner and fit into man’s world without fear. Since you have read my book Making Not Breaking you already know where I am coming from. For others, my training advice is what it is. When you read a book, read the whole book – take things in context, not out of context. Now as far as the clinics you’ve seen or participated in, there are many trainers who call themselves natural horsemanship trainers. Some are extremely talented and helpful – they know horses and know people and are good teachers. Others are into marketing and self promotion, have shaky methods or keep things just out of reach of attendees. I hope this helps answer your question and thanks for the provocative topic ! When a horse licks his lips and chews, it is usually a sign that he has just relaxed. The behavior will usually be more exaggerated AFTER a time when the horse was NOT relaxed. Not relaxed = holding one’s breath. My husband Richard Klimesh, among other things has been a farrier for 33 years and you don’t travel that path without developing your own brand of wit. His Klimisms are a treat. It’s not just what he says, but how he says it. Anyway……. Today he trimmed the hooves of his horse Sherlock. Sherlock was thinking a little less about balancing on 3 legs than he was wondering where his girlfriend Seeker was. He’d raise his head in the direction of her pen and peer intently at the barn wall like he had x-ray vision. But all this head raising causes body weight to shift and that’s hard on the person holding the hoof. So in between hooves Richard backed Sherlock up a few steps in the crossties, had him lower his head, rubbed him on the forehead and Sherlock instantly started licking and chewing and breathing. That cracked me up but there’s truth in that Klimism.